pumpkin kheer is a flavorsome, easy to prepare, traditional navratri sweet dish with pumpkin. pumpkin kheer recipe with step by step photos – a flavorsome, easy to prepare, traditional navratri sweet dish made with pumpkin or kaddu. it’s navratri. the nine nights when goddess shakti or durga is worshipped through all of her nine forms one every day. the sharad navrathri being in full swing right now, many people all over india are embracing the spiritual purification of mind-body-soul via various disciplined practices with respect to food, behavior and also thinking. the practices with respect to food, during this phase, vary to a certain extent in different regions of india. certain grains, vegetables, spices are avoided during this phase as you can read here. there is a clear seasonal affect to this practice too. vegetables available in abundance in this season are made use of the most, benefiting not only the consumer, but also the farmers who grow them. fresh and seasonal produce is like nectar to the body. one such vegetable is pumpkin. 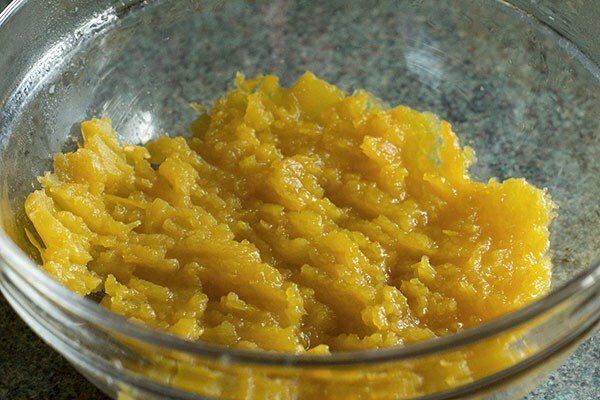 did you know, a cup of cooked, mashed pumpkin provides more than 200% of daily required vitamin A for someone on a normal diet, needed for better eyesight in dim light. a fiber rich vegetable, it can keep you fuller for longer with fewer calories ingested. a cup of cooked mashed pumpkin also provides more potassium than banana, which is beneficial for our muscles and balancing our blood pressure, for someone on a normal diet. many reasons to include pumpkin in our diet, right? but of course always follow your doctor’s/nutritionist’s advice if you are considering making any changes to your advised diet. pumpkins can be seen everywhere in the market at the moment, at its best quality and also price. the beautiful looking pile of sweet pumpkins piled up, beckoned me at the store. i simply had to get them and make the most of them. the first thought that occurred to me was pumpkin kheer. 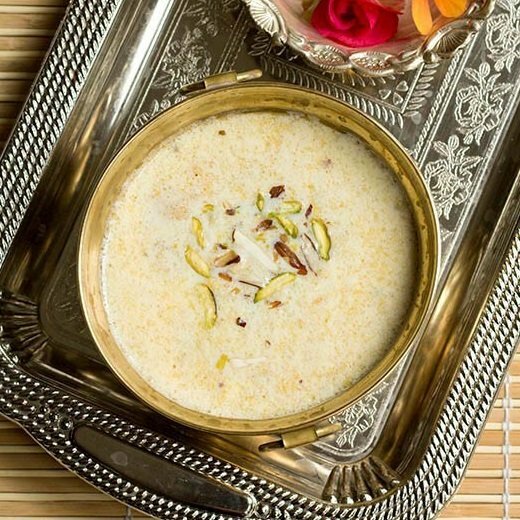 few other kheer varieties you can make during navratri fasting are makhana kheer, paneer kheer, rajgira kheer and samvat rice kheer recipe. 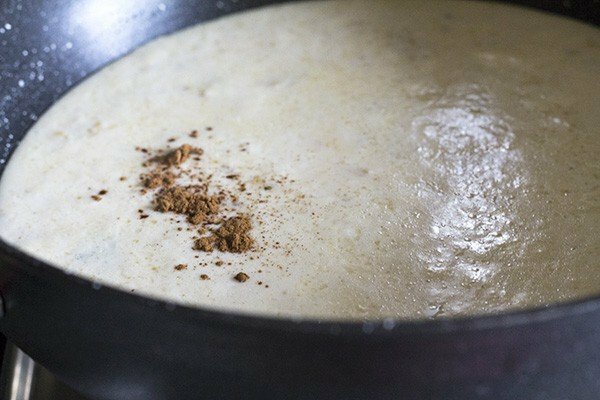 in this pumpkin kheer recipe, i have cooked the pumpkin and used it for the kheer after mashing the cooked pumpkin. another way of preparing the kheer would be using grated pumpkin (note the method mentioned in notes). practically speaking, grating the tough pumpkin is difficult. i prefer preparing the kheer using the cooked pumpkin puree. 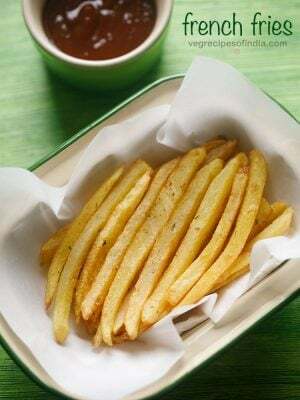 easy to prepare, requiring minimal ingredients and so delicious. offer this pumpkin kheer this navratri to the goddess, seek her blessings and enjoy with your family too. if you are looking for more navratri recipes then do check lauki kheer, dry fruits ladoo, sabudana khichdi, sabudana vada and aloo tamatar ki sabzi. you can also cook the pumpkin in an open pan, to do this, simmer in a pot of water until soft. then strain the cooked pumpkin and discard the water. 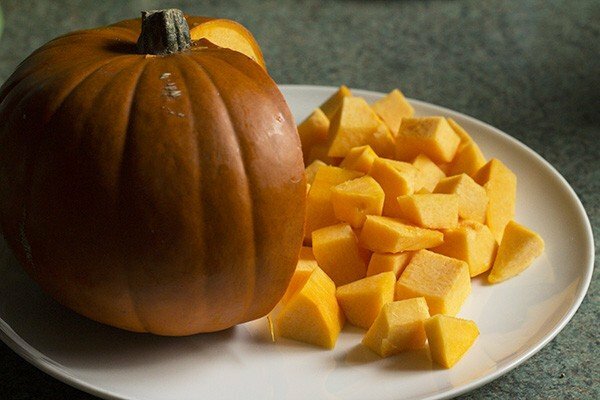 now, mash the cooked pumpkin pieces using a fork or potato masher. roughly chop the cashew nuts. then, in a thick bottomed, deep pan, add a teaspoon of ghee or oil. fry the broken cashew nuts until golden brown. take them out of the pan, keep them aside until needed. this step is optional. 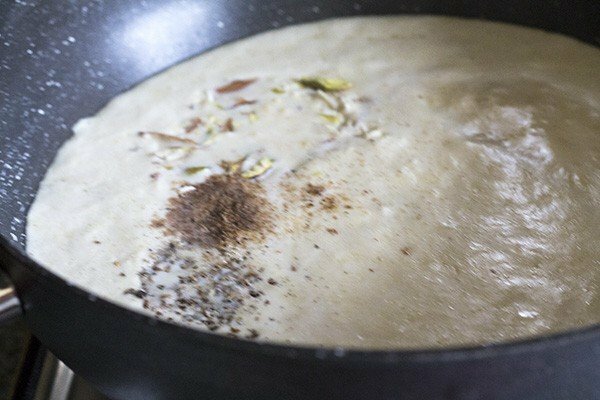 you can just add finely sliced nuts after the kheer is fully cooked. 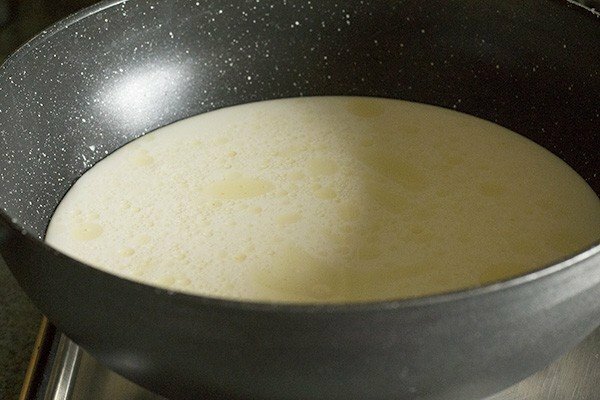 in the same pan, add 3 cups of milk. bring it to a boil by heating it on a low to medium flame. once it comes to a boil, simmer and keep stirring it now and again, taking the ladle deep into the pan, touching the bottom. this is to avoid the milk catching at the base. continue cooking the milk this way for 5 minutes. keep clearing the sides and the base as it cooks. keep the heat low enough to allow it to boil but not spill over. after 5 minutes, add the cooked, mashed pumpkin puree. mix well. mash lumps of pumpkin is any. bring this to a boil. next add 3 to 4 tablespoons of sugar. again stir to allow the sugar to dissolve and get mixed in. this will need about 1 to 2 minutes. as the sugar dissolves, if not done already, powder the cardamom and grate the nutmeg, slice the almonds, pistachios. keep these ready. add ½ teaspoon of cardamom/hari elaichi powder, ½ teaspoon of nutmeg/jaiphal powder, half the quantity of sliced nuts, mix and turn off the heat. if you wish you can add ¼ to ½ teaspoon of cinnamon/dal chini powder also. add and mix well. 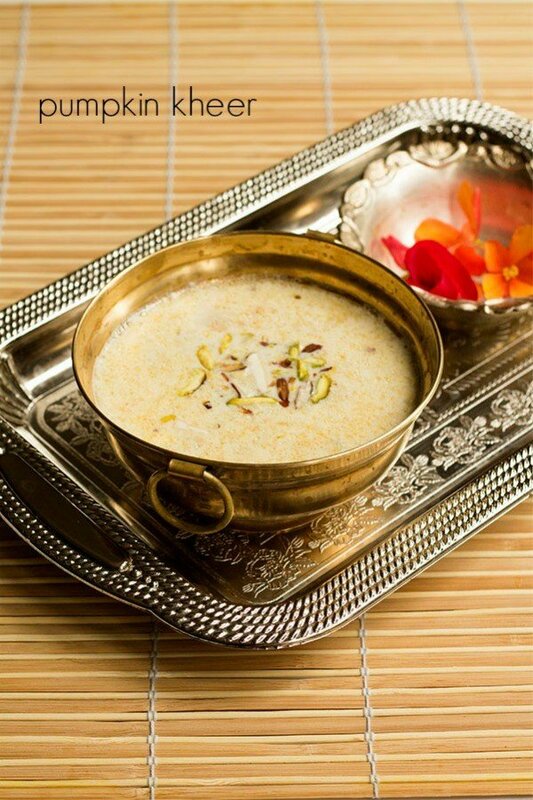 offer the pumpkin kheer garnished with the remaining sliced nuts to the goddess and/or share with your family. 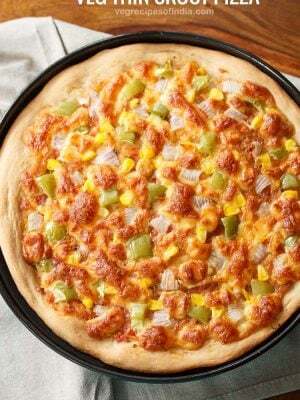 - you can use low fat milk for the recipe if preferred, it will taste good. in that case, leave out the ghee also. - for vegan version, use almond milk in place of cow's milk. 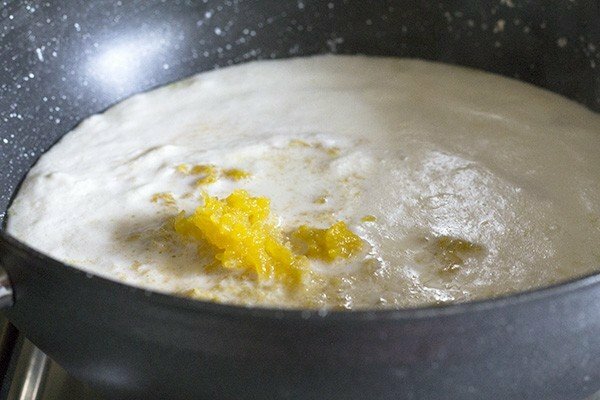 use oil in place of ghee. - nutmeg/jaiphal, cinnamon/dal chini are optional. if you do not prefer the inclusion/taste, leave them out. - method for using grated pumpkin: boil the milk in a thick bottomed pot. once it comes to a boil, add grated pumpkin and cook the mixture until pumpkin softens all the while stirring, clearing the sides and base. then add sugar,cook until it dissolves, add the cardamom(hari elaichi), and other powders, sliced nuts and serve. 2. cook these pieces in a pressure cooker adding 3 cups of water. turn off the heat after 2 whistles. allow the pressure to release naturally. 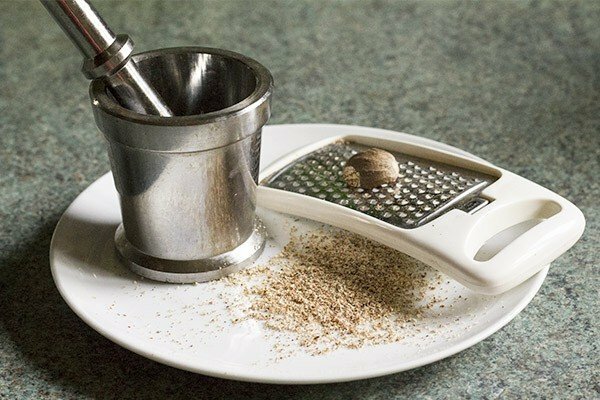 [while the pumpkin is cooking, you can slice the nuts and powder the cardamom (choti elaichi), nutmeg (jaiphal) and keep them ready]. 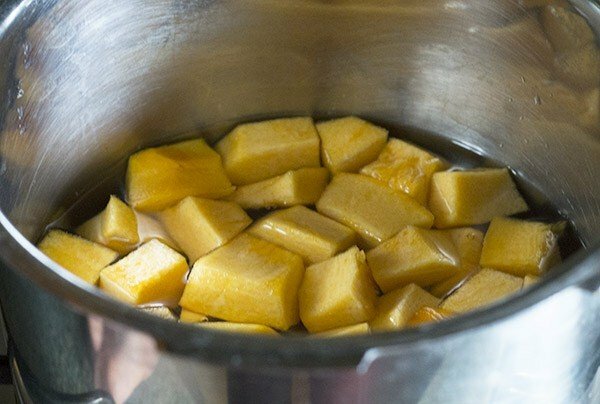 you can also cook the pumpkin in an open pan, to do this, simmer in a pot of water until soft. 3. then strain the cooked pumpkin and discard the water. you can use this strained water to make dals, in gravies, soups or for kneading rotis or paratha dough. 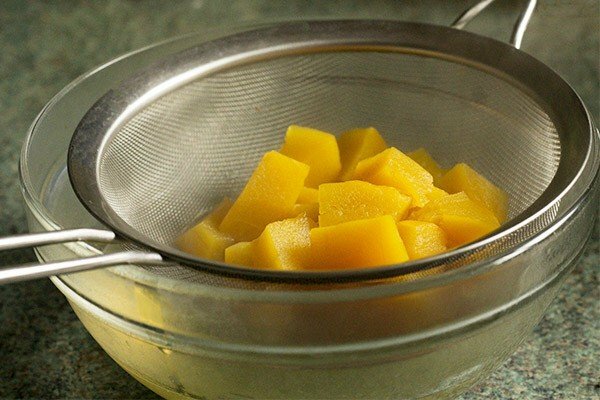 4. now, mash the cooked pumpkin pieces using a fork or potato masher. 5. roughly chop the cashew nuts. then, in a thick bottomed, deep pan, add a teaspoon of ghee or oil. fry the broken cashew nuts until golden brown. 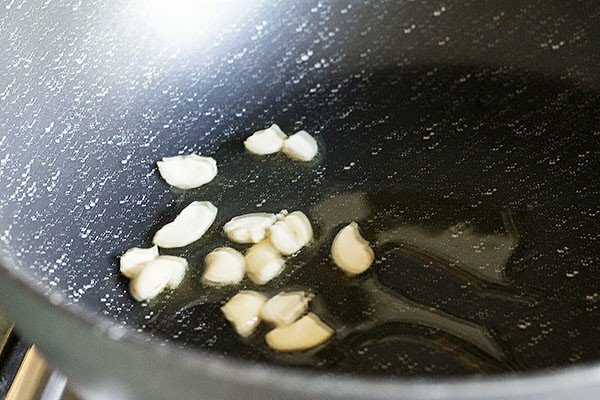 take them out of the pan, keep them aside until needed. this step is optional. instead you can just add finely sliced nuts after the kheer is fully cooked. 6. in the same pan, add 3 cups of milk (use almond milk for vegan version). bring it to a boil by heating it. for almond milk, just let it become warm. don’t bring it to boil. 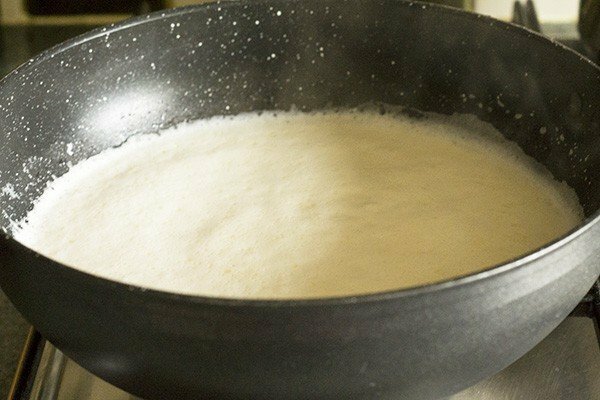 7. once the milk comes to a boil, simmer and keep stirring it now and again taking the ladle deep into the pan, touching the bottom. this is to avoid the milk browning at the base. continue cooking the milk this way for 5 minutes. keep clearing the sides and the base as it cooks. keep the heat low enough to allow it to boil but not spill over. 8. after 5 minutes, add the cooked, mashed pumpkin puree. mix well. mash lumps of pumpkin if any. bring this to a boil. 9. next add 3 to 4 tablespoons of sugar. again stir to allow the sugar to dissolve and get mixed in. this will take about 1 to 2 minutes. 10. as the sugar dissolves, if not done already, powder the cardamom and grate the nutmeg, slice the almonds, pistachios. keep these ready. 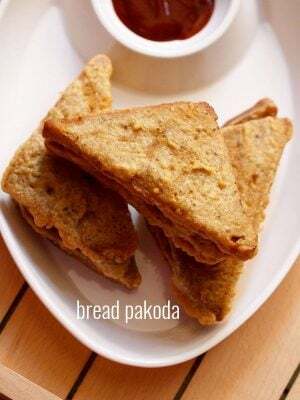 11. add ½ teaspoon of cardamom powder (choti elaichi powder), ½ teaspoon of nutmeg (jaiphal powder), half the quantity of sliced nuts, mix and turn off the heat. 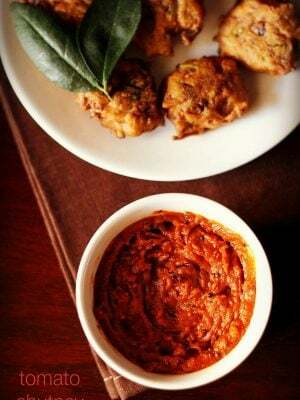 12. if you wish you can add ¼ to ½ teaspoon of cinnamon (dalchini powder) also. add and mix well. samreen, you can boil milk in the same pan. 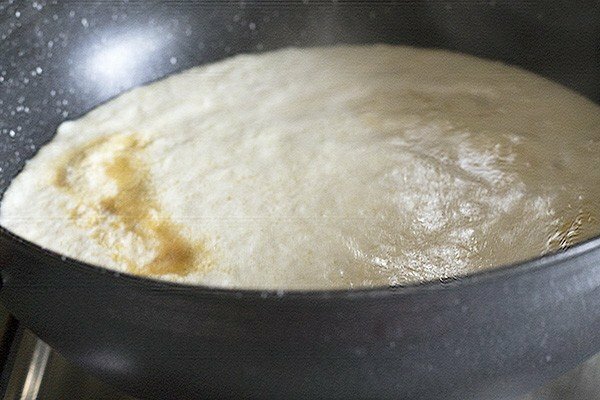 it does not matter if there is a bit of ghee in the pan. 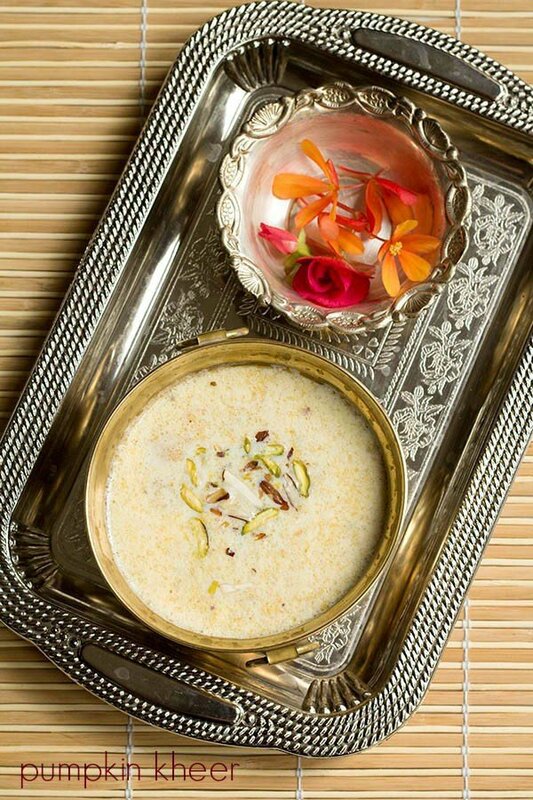 there are some kheer recipes where milk is added to melted ghee or vice versa. Can I use ‘khajoor ka ud’ for this kheer? If yes, what should the procedure be? what is khajoor ka ud? sorry, I meant khajoor ka gud… date jaggery that is used for making payesh in west bengal? you can use this jaggery. jaggery has to added at the last. otherwise the milk may curdle. first cook everything and then add add jaggery. switch off the flame and mix everything well. 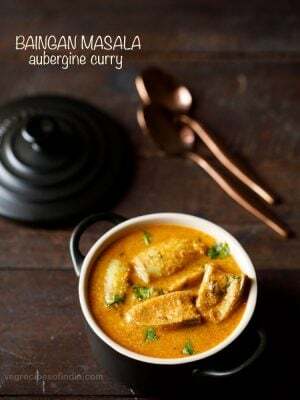 Wow yummy:)I love this recipe…thank you dasanna..
My question to this particular one can I use white pumpkin instead of yellow pumpkin? I sent you the same query few minutes ago but for some reason my comment got deleted! comment is not deleted, harini. i have replied to your comment. white pumpkin can be added. superb and delicious. thankyou so much. Looks yummy like any of your other recipes! Can white pumpkin be used instead of yellow? yes you can add white pumpkin. but i feel its better to grate it and then add.